Easy, quick, cheap, and goofproof snack that’s easily customizable. Put the ingredients in a blender or food processor, blend and you have Fresh Salsa in as little as ten minutes! Also have delicious Homemade Chips that are better and cheaper than the store bought brand. Either in a food processor, by hand, or a chopper like the one from pampered chef, chop the peppers, onions, cilantro, and tomatoes. *cut jalapenos last then automatically throw away seeds, put any utensil that you used in the sink and wash your hands. With any pepper or onion you should do this but jalapenos are the worse if by chance you touch your face so better safe than sorry. After those are chopped place them in a large bowl and add in the rest of the ingredients. Stir, stir, and stir. Make sure everything is really mixed in. Do this by hand, or if you like it really smooth keep it in the blender or food processor. Let sit overnight in the fridge or for a few hours. The flavor really settles in after a day or two but it’s so hard to wait! For the chips heat up the oil in a deep fryer with a basket. Cut the tortillas in triangles. Place tortillas in fryer and cook for about 4 minutes or till golden brown. Place on a rack with paper towels underneath and sprinkle with seasonal or salt to your liking. 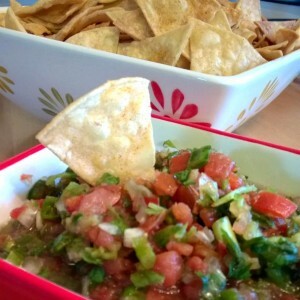 Let cool and dip in salsa! Can Change up salsa by adding different peppers like habanero, more jalapenos, any bell pepper, or whatever produce you like, mangos are also pretty good in salsa. 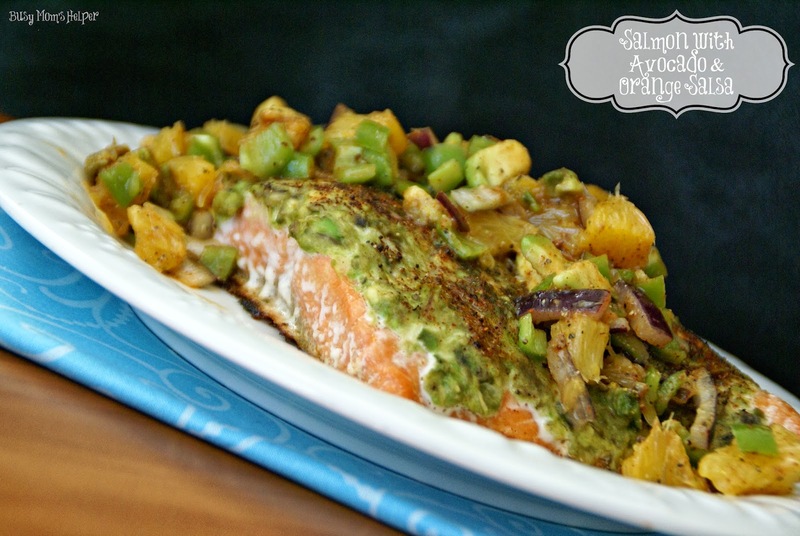 Need a quick dinner that’s sweet and savory? These Salsa Pork Chops are quick to put together and make a delicious dinner for any salsa lovers (like me!). 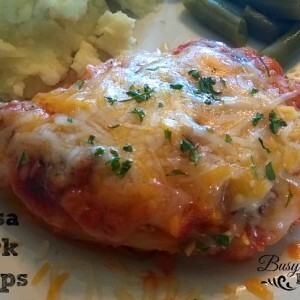 These Salsa Pork Chops are great for dinner and mix well with different vegetables and mashed potatoes or baked potatoes. The night before I get the pork chops ready by stabbing them a few times with a fork and then placing the pork chops and salsa in a bag and leave in the fridge. Place the pan in the oven and cook for about 50 minutes. Let cool a couple minutes and serve! Tastes great with baked potatoes and green beans, can add mushrooms, cilantro, or different kinds of cheeses to the pork chops if you desire. Once boiling take off burner and let cool. Who else here is a huge fan of dips? I love grabbing a bag of chips and some delicious dip for snacks, or even when I’m too hurried for lunch some days! 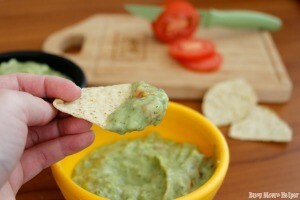 There’s so many good recipes out there, but one of my favorite dips is this creamy Salsa Verde! I originally shared my Creamy Salsa Verde back in 2013, and although I’m still a big fan of that particular recipe, I’ve made some changes so it’s now near perfection! We were craving this so bad the other week that we whipped up a batch, all excited…and realized we had NO CHIPS. Ugh! So Hubby drove to the store right then, even though it was like 9pm, and grabbed a couple bags. when you want a dip fix, you WANT a dip fix! Cut your tomatillos into fourths and add them, your garlic, onion, lime juice, cilantro and honey into a blender and blend well. Remove the pit from your avocado and scoop the good stuff into the blender. Add your Jalapeno Tabasco, adding more for a ‘hotter’ flavor and less for more ‘mild’. It’s easy to add more if you decide it’s too bland, so just add a bit to start then add a bit at a time until you reach your desired taste! What are YOUR favorite types of dip to go with your chip of choice? Hubby loves fish. Like, he gets all giddy when he has an opportunity to eat it. I, on the other hand, can’t stand it. Now don’t be all like ‘well, maybe you’d like this if you tried it, or this’. I’ve tried MANY types of seafood. I’m all for trying new foods (I’ve even tried alligator, frog legs and escargot before). And to be quite honest, I WISH I liked seafood because of the healthy Omega 3s and healthy fats. Alas, it’s just not in me to like it. Instead, it’s gag it and hope I don’t have to spit it out. 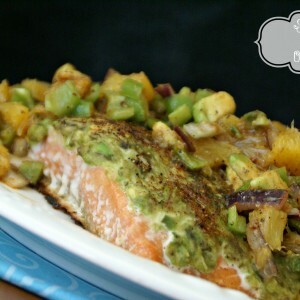 So this post is compliments of Hubby, who says this recipe for Salmon with Avocado & Orange Salsa was absolutely WONDERFUL and such a ‘perfect flavor combination’! Juice the lime. Put 2 tbsp. of the juice in a bowl for the salsa. Add 1 tbsp. juice from the Oranges, and 2 tbsp. Olive Oil and mix well. Baste the Salmon, then use the rest to coat the baking pan. Place salmon in the pan. In a medium bowl, mix the diced Red Onions and Jalapeno Chili. This will be the salsa bowl. Cut the Avocado in half. Take one half and dice it, then put the diced pieces into the salsa bowl. Smash the remaining half and spread over top of the Salmon. Sprinkle a bit of the Salt, Pepper and Chili Powder over the Salmon. If any remains, add it to the salsa. Bake for about 20 minutes, or until Salmon is firm and cooked completely. Remove and garnish with Salsa as desired.